Duke of Cornwall's Light Infantry 8th Bn. 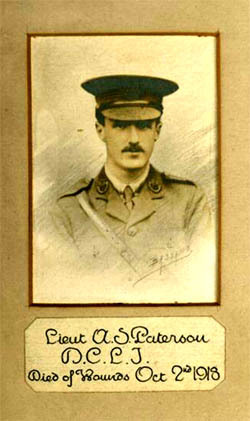 Son of Arthur and Kate Paterson of Banstead, Surrey. 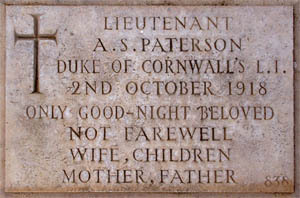 Arthur Stanley Paterson married Ethel E Harris in 1910 and this was registered at Falmouth in Cornwall. In 1911 the family lived at 5 Biggindale Road, Streatham. Arthur Stanley Paterson, then aged 22, was born in Hornsey, Middlesex, and his birth was registered in the 2nd Qtr of 1889 at Edmonton. In 1911 he was an Assistant Schoolmaster. His wife, Ethel Elizabeth (nee Harris), was also aged 22, and was born in Falmouth, Cornwall. (She was living in Budock, Cornwall in 1901 census ). Arthur and Ethel had no children in 1911 and they lived with Arthur's parents, Arthur William Paterson, 67, Born Hadley, Mddx, living on private means, and his wife Kate Helena Gibbs Paterson, 60, born Enfield., and four more of their children aged 19 to 30. They moved back to Cornwall (8, Beach Rd., Newquay) where Arthur became an Assistant Master at Cathedral School, Truro. WWI intervened and like many masters at the school, Arthur joined the army serving with the Duke of Cornwall's Light Infantry. The 8th (Service) Battalion of the Duke of Cornwall's Light Infantry were formed at Bodmin in September 1914, and attached to 79th Brigade in 26th Division. It moved to Codford and was in billets in Bath in November 1914. It then moved to Sutton Veny in May 1915 and eventually landed at Boulogne on 22 September 1915. On 13 November 1915 the Battalion sailed from Marseilles for the port of Salonika in Greece. The troops were sent to provide military assistance to the Serbs who had recently been attacked by combined German, Austro-Hungarian and Bulgarian armies. The intervention came too late to save Serbia, and after a brief winter campaign in severe weather conditions on the Serbian frontier, the Anglo-French forces found themselves back at Salonika. After preparing the port of Salonika for defence, the troops moved up country. During 1916, further Allied contingents of Serbian, Italian and Russian troops arrived and offensive operations began. These culminated in the fall of Monastir to Franco-Serb forces during November. There was a second offensive during the spring of 1917, the British part of which was the First Battle of Doiran (24-25 April and 8-9 May 1917). It made little impression on the Bulgarian defences. The front line remained more or less static until September 1918, when a third offensive was launched. This time, the British attacked at Doiran for a second time (18-19 September 1918). With a breakthrough by Serbian forces west of the river Vardar, the Bulgarian army was forced into a general retreat. The campaign concluded with the surrender of Bulgaria on 30 September 1918. In 1922 the Alleyn's School organ was installed as a memorial to the war dead and the Honours Boards were unveiled in the Great Hall under the School organ balcony. Unusually, the cemetery at Polikastron does not have the normal CWGC white Portland stone headstones, but it has a stone plaque for each man. Plaque photo adapted from a TWGPP photograph. 10 Pl C Coy. London Regiment (Royal Fusiliers) 2nd Bn. Alfred was born on 20 September 1888 in Chelsea, the son of a builder and decorator. 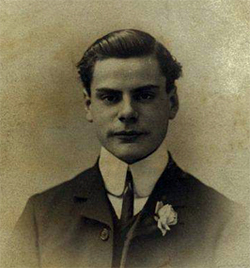 He was one of twelve siblings, six of whom had died by 1911 when the family are shown in the census as living at 57 Christchurch Street Chelsea. Whilst still at the Christchurch St address, Alfred married Mary Jane Long Hewitt, a widow aged thirty-four, from Birmingham, on 5 July 1913. She already had a ten-year old son, John (Jack) William Hewitt, born 1 July 1903 in Chelsea. By this time, Alfred had followed in his father's footsteps and become a painter and decorator. 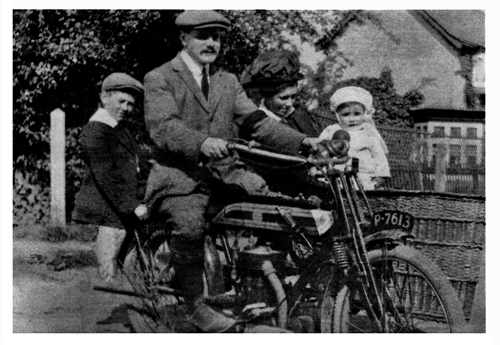 The family soon moved to 18 Diceland Road, Banstead, and Alfred and Mary Jane had a son on 13 May 1914 who they called Alfred William Pidgeon. 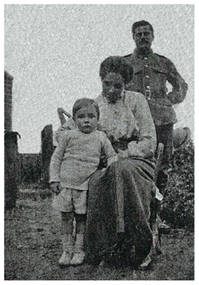 his wife Mary Jane and their son Alfred William. WWI interrupted family life and Alfred, like many more young men from Diceland Road, joined the army, initially the 5th Bedford Regiment, and later the 2nd battalion London Regiment (Royal Fusiliers). He sent cards back home, and one dated 17 May 1917 posted in Lowestoft was addressed to his son Alfred William. Just a card to wish you many happy returns on your birthday. I am sorry I am not able to be with you, but I hope to next year. . .
Give mother a big kiss for me. With love and best wishes. That wish was never to come true. Alfred now with 'C' Company 2/2 Londons which was part of 58 Division of II Corps of the 2nd Army, found himself at the 2nd Battle of Passchendaele which took place between 26 Oct and 10 Nov 1917. Alfred would not survive the first day. Conditions were appalling, very wet and muddy with the terrain full of shell holes. The following abridged extract from The Royal Fusiliers in The Great War describes the scene and events leading up to the battle. "By this time the persistent continuation of wet weather had left no further room for hope that the condition of the ground would improve sufficiently to enable us to capture the remainder of the ridge this year. By limited attacks made during intervals of better weather, however, it would still be possible to progress as far as Passchendaele. . .
" To maintain his defence on this front the enemy had been obliged to reduce the garrison of certain parts of his line to a degree which justified the expectation that a sudden attack at a point where he did not expect it might attain a considerable local success. The front for such an attempt had been selected. . . ."
On October 25th 1917 a strong west wind somewhat dried the surface of the ground and the night was fine. The stars shone out with the sharpened clarity of a frosty atmosphere. Another small attack was planned for the 26th and the 2nd line battalions of the London Regiment took up their positions with the 58th Division. The 2/2 Londons, attacking at 5.40 a.m., reached Cameron House — about 250 yards below the Poelcapelle-Spriet road — at 7.15 a.m. 'A' Company cleared three of the four " pill-boxes " at this point and sent back 17 prisoners. 'D' Company, at 6.30 a.m. reached a " pill-box " about 200 yards above the Lekkerboterbeek and stormed it, capturing 32 prisoners, and three-quarters of an hour later had to repel hostile counter-attacks directed against this point and Cameron House. 'A' Company, finding their flank uncovered by the retirement of the unit on their left, were compelled to withdraw ; but 'D' clung to the mebus they had captured until the end of the day. Moray House, lying about 550 yards due east of this "pill-box," held up 'C' Company all the day. The casualties were 11 officers (3 killed) and 386 other ranks. Initially, Alfred was reported "wounded and missing" and two letters stating as much were sent to Mrs Pidgeon who had to pursue the matter via The Red Cross when she heard no more. It was to be a full six months before more was known, but still the circumstances of Alfred's disappearance were far from clear. In his letter dated 27 March 1918, the Earl of Lucan writing under the heading of The British Red Cross, advised that Alfred had never been included on any of the hospital lists however he had found an eye witness to the incident. "I knew Pidgeon slightly. He was a stiffly built fellow, about 5ft 6 ins. dark hair and about 30. On the 26 Oct we were attacking in the Ypres sector in the early morning. We took some shell holes and held them. I was in a shell hole at the objective and Pidgeon and three or four other men were there too. While we were there, the Germans made a counter attack which we repulsed. I saw Pidgeon hit in the side of the face by a rife bullet. I saw him bound up and we watched him arrive at the First Aid post which was only about 200 yards from where we were. He could not have been taken a prisoner. The Germans never put us back. We were relieved the following morning." There is no record of any other information being received by the family who had no choice but to accept that Alfred would never return. son of Alfred Allen Pidgeon. In May 1920, Mary Jane and her two sons, Alfred William Pidgeon and John Hewitt, sailed to the United States on the RMS Mauretania. They settled in Cedar Rapids, Iowa, in the State where many of Mary Jane's relatives had settled. Mary Jane Pidgeon, never remarried and she died in 1973. Alfred Allen's son, Alfred William, was extremely proud of his father's service and sacrifice in WWI, and he went on to serve in the United States Army Air Corps in the Pacific during WWII. Whilst in St. Louis, Missouri, he met a girl he liked but lost touch with her. Some thirty years passed, then, completely unexpected, he received a Christmas card from her; Albert and Bonnie were married just six months later. He died in April 1990. 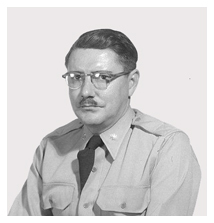 Alfred William never had any children of his own and it was his stepdaughter Nancy who contacted BHRG to share his father's story — the story of Alfred Allen Pidgeon. Memorial Reference: Panel 148 to 150. TYNE COT MEMORIAL Zonnebeke, West-Vlaanderen,Belgium. The War Diary is at the National Archives under WO95/3001 and is digital so can be downloaded from the NA Catalogue. Son of George Hillier Powell and Lucy Powell, of Laurel Cottages, 11 Shrubland Rd, Banstead, Surrey. George's His father was a night attendant at an Asylum, probably the Banstead Asylum down Sutton Lane. His mother Lucy was eleven years younger than her husband. George had one older sister, Dorthy [Dorothy] Jane, and four younger brothers, each one having been given two names shown in the 1911 census as : Winston Baden (10), Arthur William (8), John Henry (5), and Robert Philip (2). The youngest was Vera aged just three weeks. As the first born son, George was named after his father. Their house was described as having five rooms. George attested at Epsom on the 13 of September 1916 when the documentation shows he was eighteen years and no months old. He was described as 5 feet 9 inches tall weighing 122lbs. His address was confirmed as Shrubland Road and his occupation shown as "Grocer's Carman". 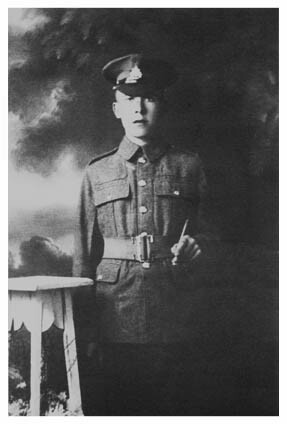 He initially joined the 31st Training Reserve Battalion of the East Surrey Regiment and his number was 30793. His service record shows that he actually joined the 31st Training Reserve Battalion on 5 March 1917 and was soon on his way to Dover. 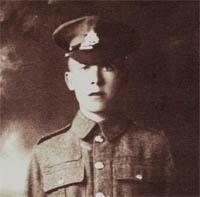 A few weeks later, on 13 April he was transferred to the 30th Training Reserves. In August 1917 he was transferred to Dover, and was 'Far Posted' to the 12th East Surreys at Etaples on 17 October but was almost immediately transferred again to the 1st Battalion which proceeded to Italy on 12 December 1917. It was shortly before moving to Italy, on 3 December, that George was disciplined for not complying with an order. It seems he went into an orchard when specifically told not to do so. His punishment was '3 days CB' [ Confined to Barracks]. The 1st Battalion served in France during the entire War except for the short tour in Italy from 1917 to Spring 1918 when George returned to France on 3 April 1918 as one of 606 ORs (other ranks) then comprising the 1st Battalion. The Division was to relieve the 2nd Canadian Division south of Arras. By 10 April the Division was in Grenas and received orders to march to Bailleulmont. They set off at 8.00am but the relief of the Canadians was cancelled at 10.am. This was not totally unexpected in view of the German attack on Messines Ridges early the same day. On the following day, orders were received to move to Thiennes East of Aire. The weather was cold, generally with a strong breeze and showers. During heavy fighting, the Division maintained its position and beat off many determined attacks, with heavy loss to the enemy. The battalion was able to withdraw to the reserve lines on the 16th. Over the next few days more trench digging was completed however it was only possible to dig eighteen inches down before water was encountered, and this meant that earthworks had to be piled in front of the trench to give additional protection, particularly as enemy snipers were always active, supported by intermittent shelling and gas attacks. By the 25th the battalion was only 100 yards from the enemy front-line. In the early days of May, the battalion moved back to Villorba Camp from where they moved out to relieve a Kent Battalion on 9 May. The next few days were reasonably quiet with only sporadic shelling and machine gun fire, particularly at night. The battalion was relieved by the Devons on the 14th. This relief took place after only five days in the line in order that the battalion might go out for training, carry out an attack on 20 May and be relieved on the night of May 21st/22nd in the course of the usual brigade relief. On the 16th, the troops had a restful day whilst a replica of the place intended for the attack was taped out. Over the next two days, the various Companys practiced their part of the attack on the marked out course. Meanwhile artillery barages and over night wire cutting was taking place to ease the route of the attack. Scouts however reported that these preparation had made little differene and the battalion would run into serious obstacles. Further action was organised to ensure that there would be plenty of gaps for the attackers to go through. The attack was ordered and No.4 Company quickly achieved its objective with one man killed by a shell. No.3 Company captured several machine guns experiencing some small casualties.No.2 company had to get through a small gap in the hedge and for a time came under fire from a machine gun positioned in a house opposite. This was quickly dealt with and the Company also went on to achieve their objective. This had been a successful attack but the 1st battalion of the East Surrey regiment lost 27 other ranks with a further 85 wounded. The final entry on George's service record (dated 25 May 1918) simply shows the words 'KILLED IN ACTION, Field 21 May'. The War diary shows that the battalion was relieved on 22 May and burial of the men killed were conducted at Tanhay Cemetery with about 100 officers and men marching from the Villorba camp. The service was conducted by the Rev. E J Bandford. George was awarded the British War Medal 1914-19 and the Victory medal. On 5 Sept 1918 the Officer in Charge at Hounslow forwarded George's belongings to his father. The property comprised of letters, postcards, two broaches and two coins. Grave Reference: Plot 2. Row D. Grave 8. TANNAY BRITISH CEMETERY, THIENNES, Nord France.